Kris is a licensed and certified Speech-Language Pathologist in the state of California and a current member of the American Speech-Language and Hearing Association. She is also a Certified Orofacial Myologist, and ranks as 1 of 4 Certified Orofacial Myologists in all of San Diego. In fact, she is 1 of 3 Certified Orofacial Myologists in all of San Diego who is also a Speech-Language Pathologist, an unparalleled combination of degrees. She received advanced training in myofunctional therapy from the nationally renowned Katha Phair, B.A., COM, who held a top myofunctional therapy practice in San Diego for nearly 40 years. Kris and her colleague Nicole Goldfarb were selected and intensely trained by Katha to take over her practice when she retired in 2014. Kris received her Master of Science degree in Communication Sciences and Disorders from Appalachian State University. Kris also holds a bachelor’s degree in Psychology from the University of Arizona. In addition to her advanced training in tongue thrust, feeding issues, and sleep-disordered breathing, she has clinical experience in the evaluation and treatment of a variety of childhood speech and language disorders including autism spectrum disorders, articulation/phonological disorders, language delay/disorders, and stuttering/fluency. Kris has worked in a variety of settings including daycares, preschools, elementary and high school settings, home visits, and a post acute center. At the post acute center in Raleigh, NC, Kris did evaluations, language and articulation therapy, and oral motor exercises with her patients. She also worked with individuals with traumatic brain injury, adults with Alzheimer’s disease, patients post-stroke, as well as performed dysphagia treatment. She has led preschool language groups and using play-based therapy and different forms of technology to enhance communication and learning such as interactive stories, music, computers, and the iPad. Kris has also run social skills groups including the Social Stars program at SDCST and local preschools. Kris has used various applications on the iPad for improving language and narrative skills (Dragon Dictation), speech sound production, augmentative and alternative communication (Proloquo2Go), and general motivation through technology. She has taken trainings on behavior modification strategies with emphasis on autism and the treatment of severe phonological disorders using the Cycles Approach. Kris is trained in the PROMPT method, a highly advanced hands-on manual therapy approach to treat apraxia of speech and articulation disorders. She also has DIR/Floortime interest and training, and she holds a Certificate of Mastery for mastering the materials of the Professional Course on the Greenspan Floortime Approach. Kris has also had the amazing experience of working in an orphanage in Guatemala. Kris brought supplies such as toys, chalk, books, etc to children in the orphanage. At the orphanage, she also worked on feeding with the infants and toddlers as well as language, social, and play-stimulation activities. At the orphanage she worked with several children with cerebral palsy. Kris speaks fondly of this amazing experience of being able to support and enhance the lives of children with significant needs. Kris’ specialization is in pediatrics and also orofacial myofunctional therapy for individuals of all ages, and she is committed to providing high quality, evidence-based therapy and implementing successful strategies to meet her patients’ speech, language, and myofunctional goals in a fun, engaging, educational, and effective manner. Kris also understands the importance of involving families and caregivers in the therapeutic process. 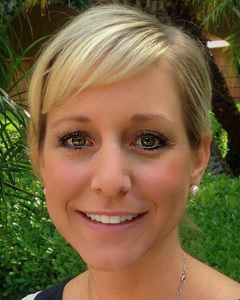 Kris has a sweet, warm, and engaging personality, and all of her patients are drawn to her! We are lucky to have Kris and her unmatched skills and advanced training techniques here at SDCST!